Everyone knew the Kline Center expansion was a pretty special project even during the planning stages. 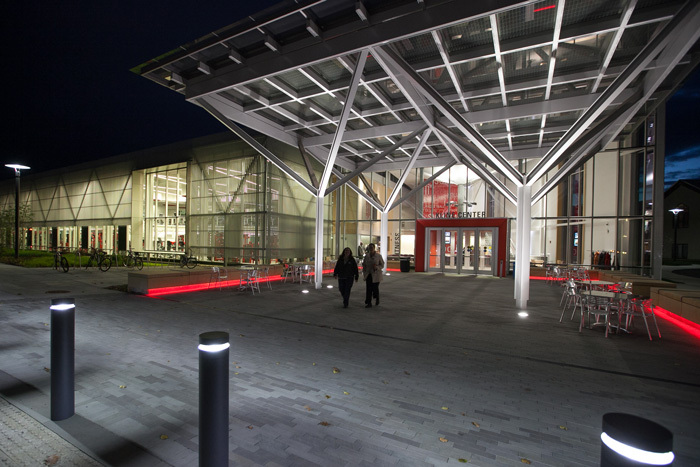 But then, back in August 2014, when the sleek 29,251-square-foot structure opened its doors to the Dickinson community, the space, facilities and atmosphere of the new building made it an overwhelming success. With its 70 cardio training machines, outdoor stretching patio, half-court basketball court, five international squash courts (the home of new men's and women's varsity squash programs), a tai chi garden and the Juice Box, the Kline’s new healthy-options café, the expansion has something for everyone. And it’s got plenty for the environment as well, ranging from a state-of-the-art stormwater management system and perimeter screen—which minimizes direct sun into the building, thereby reducing heat gain—to rain gardens, bioswales and energy-saving skylights throughout. Fitting nicely into the college's sustainable-building ethos, the Kline expansion also is poised to become Dickinson’s sixth LEED Gold building, as designated by the U.S. Green Building Council, with a seventh, a new residence hall, to begin construction next year.